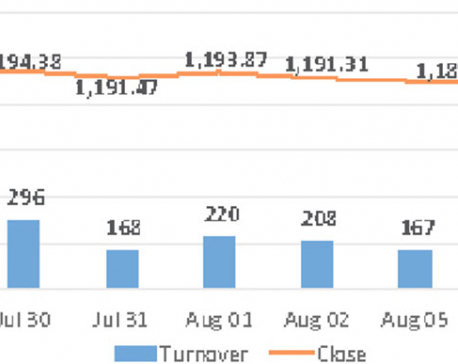 KATHMANDU, July 12: Stocks got off to a strong start in the morning session on Wednesday, managing to move 15 points higher as the session progressed. However, the benchmark Nepal Stock Exchange (Nepse) index cut gains in the final trading hour to close flat. The index dropped 0.29 points to end at 1,205.64 points, recording a turnover of Rs 479 million. 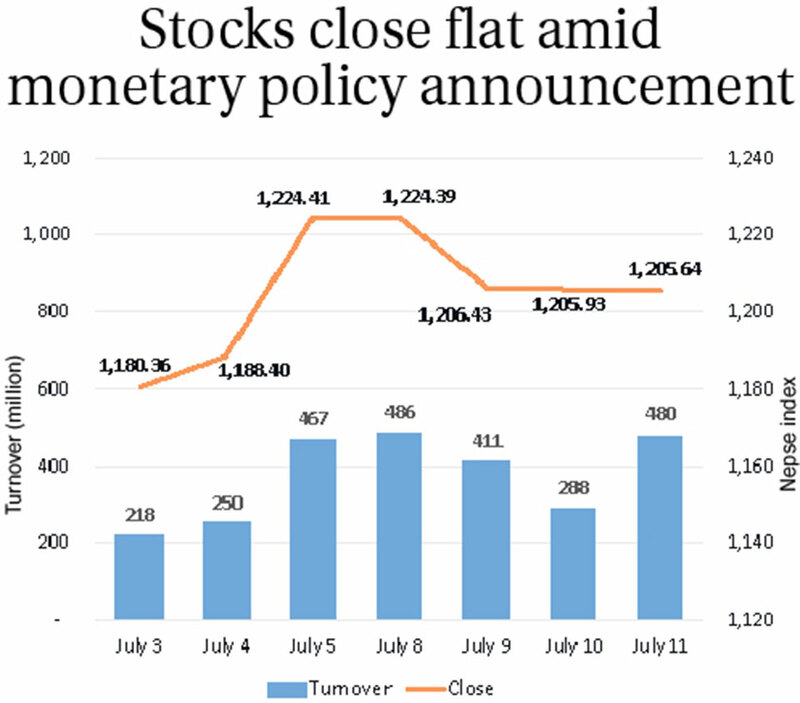 The market retraced as investors kept a close eye on the monetary policy unveiled on Wednesday. The policy has targeted to achieve 8 percent economic growth in Fiscal Year 2018/19 while containing inflation at 6.5 percent, among other announcements. Additionally it has kept Cash Reserve Ratio (CRR) for bank and financial institutions at 4 percent which will add more liquidity in the market. In terms of sector performance, most of the sub-indices ended in green led by Microfinance Sub-index which surged 1.78 percent. The sub-indices of Development Bank and Hydropower groups also showed slight upward movement. On the other hand, weakness was visible in Hotel stocks as its sub-index slumped 4.55 percent. Besides, Banking, and Manufacturing & Processing sub-indices also closed lower. Prime Life Insurance Company Ltd Promoter Shares was the most active stock on the day, recording transactions of over Rs 107 million. Next on the list was Nepal Telecom Ltd which logged total turnover of over Rs 47 million. Swarojgar Laghubitta Bikas Bank Ltd and Grameen Bikas Laghubitta Bittiya Sanstha Ltd were the other active stocks on the day. In terms of gaining stocks, Microfinance scrips turned in some of the best performances of the day. NMB Microfinance Bittiya Sanstha Ltd rallied 10 percent after the company notified Nepse for 150 percent rights issue. Similarly, share prices of Global IME Laghubitta Bittiya Sanstha Ltd, Nagbeli Laghubitta Bikas Bank Ltd, Vijaya Laghubitta Bittiya Sanstha Ltd and Mahuli Samudayik Laghubitta Bittiya Sanstha Ltd surged by 4 to 6 percent each. Conversely, Everest Bank Ltd Con Pref Share, Soaltee Hotel Ltd and Barun Hydropower Company Ltd saw their share prices go down by over 5 percent each. Other losing stocks on the day include Hathaway Finance Company Ltd, First Microfinance Development Bank Ltd Promoter Share and National Hydropower Company Ltd.
On the news, NMB Bank Ltd has announced 15 percent bonus shares to its shareholders. After adjusting bonus shares, it will meet the mandatory capital requirement of Rs 8 billion. Deva Bikas Bank Ltd has signed agreement with Western Development bank Ltd for its acquisition. Post-merger, it will be the biggest development bank of the country. The bank also held its Annual General Meeting (AGM) on Wednesday. Distribution of 17.10 percent bonus shares was the main agenda of the AGM. 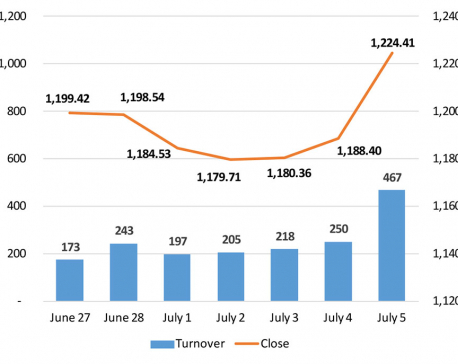 As per the ARKS technical analysis, the market has continued to show a lack of significant momentum with the index still trading close to 1,200-point level. The index movement at this level is crucial as it may indicate a possible direction for the market.